ALASKA (1885) According to Tornfelt and Burwell’s Shipwrecks of the Alaskan Shelf and Shore (1992), the Alaska, a two masted schooner of 138 tons was lost in the Bering Sea in 1885. No further information is given. ALASKA QUEEN (1965) The 40 ton 61 foot wooden oil screw tug Alaska Queen was consumed by fire July 17, 1965 at Rocky Point, Bechevin Bay on Atka Island in the Aleutians. The fire originated in the engine room. The captain of the vessel suffered burns attempting to put out the fire. He and the two other crewmembers escaped to a skiff. ALASKA RANGER (2008) The 184 foot catcher-processor Alaska Ranger lost her rudder, flooded and sank March 23, 2008 approximately 120 nautical miles west of Dutch Harbor. The vessel was on her way to fish Mackerel in the Aleutian Islands with 47 crewmembers aboard. The U S Coast Guard was able to lead the rescue of 42 of the crewmembers using a Helicopter from Saint Paul Island, a C-130 Aircraft from Anchorage and the USCGC Munro. The Alaska Warrior, sister ship of the Alaska Ranger rescued 22 crewmembers and the U S Coast Guard rescued 20. Conditions at the time were beyond treacherous. Lost from the Alaska Ranger were captain Eric Peter Jacobsen, David Silveira, Byron Carrillo, Daniel Cook and Satoshi Konno. ALASKA STAR (1988) The 153 foot processing vessel Alaska Star was lost February 20, 1988 in Nikolski Bay on Umnak Island. All 15 crewmembers were rescued by the fishing vessel Neahkahnie in blinding snow and 60 mile an hour winds. The Alaska Star grounded on a rock 100 yards from the beach, rolled over and sank the following day. ALASKAN MONARCH (1990) The 92 foot steel crab fishing vessel Alaskan Monarch became trapped in ice and grounded while attempting to enter Saint Paul Harbor March 15, 1990. The vessel’s rudder and depth sounder transducer were destroyed by the ice. High winds drove the Alaskan Monarch against the beach and 25 foot waves broke over her. The U S Coast Guard Cutter Storis was in the area and responded to the scene. Several attempts were made to get a towline to the Alaskan Monarch but heavy ice and huge seas prevented success. An HH-3 helicopter from U S Coast Guard Air Station Kodiak piloted by veteran commander Lt. Laura H. Guth arrived on scene and began airlifting the six crewmembers to safety from the unsteady deck of the Alaskan Monarch. After four had been pulled into the chopper, a large ice filled wave washed over the distressed vessel depositing the remaining two crewmen into the frozen saltwater. Both were quickly pulled from the ocean into the rescue helicopter and flown to safety. The Alaskan Monarch broke up on the beach. Wreckage was later removed by Magone Marine Diving and Salvage. ALEUTIAN II (1962) The 12 ton 29 foot steel oil screw fishing vessel Aleutian II foundered August 8, 1962 near Makushin Bay. ALEUTIAN ENTERPRISE (1990) The 142 foot fish processing trawler Aleutian Enterprise capsized and sank March 22, 1990 approximately 60 miles south of Saint Paul Island in the Bering Sea. The vessel had just taken a large cod end (loaded net) up the stern ramp. Multiple vessels responded and 22 crewmembers were rescued from the water and life rafts. Nine were lost including eight crewmembers and one observer. Crewmembers lost were Nello Marciel (55) of San Diego CA, John Dietrich (31) of Seattle WA, Matthew J Schneider (22) of Issaquah WA, Joseph J Alaimo (45) of Yakima WA, Robert W Davies (26) of Renton WA, Jeffrey A Houston (21) of Warren OR, Javier Martin V Castro (27) of Seattle WA and David J Jefferies (19) of Fontana CA. The observer lost was Robert McCord (35) of Englewood CO.
ALEUTIAN HARVESTER (1985) The 94 foot trawler Aleutian Harvester disappeared with all hands November 26, 1985 during a North Pacific storm. The vessel is believed to have been lost 30 miles south of Unalaska. Only her EPIRB was found. Lost were Mark Zimney of Anacortes WA, Danny Martin of Homer and Stan Anderson of Naples ID. ALEUTIAN MONARCH (1981) The 460 foot fish processing ship Aleutian Monarch caught fire, burned for five days, and was taken out to sea and scuttled November 12, 1981 near Beaver Inlet. The vessel was a converted WWII cargo ship. Additional Information: Tonnage 128.88, Built 1886 at Cambridge Maryland, Registration San Francisco, ON 106416, Master W T Shorey of San Francisco, Owner John A Magee of San Francisco, Length 87 feet, Breadth 25 feet, Depth 10 feet. ALL ALASKAN (1987) The 340 foot steel fish processing ship All Alaskan ran aground in a gale March 20, 1987 north of Big Lake on Saint Paul Island. All 142 persons aboard the vessel were safely removed. What remained of the vessel was later demolished and taken away. Evidence of this wreck may still be on site and of interest. ALL AMERICAN (1996) The 148 foot steel crab fishing vessel All American stranded and was lost February 29, 1996 on the north shore of Saint George Island. The master of the vessel left the bridge to investigate an unusual vibration in the engine room and the All American grounded. The vessel sustained damage to the forward hull and began to flood immediately. All five crewmembers were rescued by an H-65 helicopter launched from the U S Coast Guard cutter Sherman. Magone Marine of Dutch Harbor was called upon to remove diesel fuel, lube oil, hydraulic oil, bilge and waste oil after which the vessel was to be “disposed of at sea”. The S S Montauk collided with the Alloway just after the towing cable parted sustaining $10,000 worth of damage to her superstructure. The Alloway, valued at $200,000, was lost for good along with her 4,500 ton cargo of lumber. One crewmember, a 20 year old oiler named James L. Posey refused to leave the Alloway after all others had abandoned ship. His intent was to claim salvage rights but his effort only lasted two days. The vessel broke up in the surf soon after Posey left the ship aboard a U S Coast Guard cutter. The Alloway was scheduled to be scrapped on her arrival in Japan. Comments: H W McCurdy has this wreck listed at Uganik Island. Additional Information: Tonnage 6113 Gross 4383 Net, Built 1918 at Oakland California, Construction Steel, Registration Seattle, ON 216557, Owner C P Cox Corp of Seattle, Insurance unknown. ALTAIR (1983) The 190 ton 111 foot steel oil screw fishing vessel Altair disappeared with all hands February 14, 1983 on her way from Dutch Harbor to the Pribilof Islands. The Altair was loaded with crab pots and carried a crew of seven. Her sister ship, the Americus was found bottom up along the same route that both vessels would have taken to the crab grounds, having departed Dutch Harbor hours apart the morning of February 14, 1983. The Americus was found capsized that afternoon, 25 miles NNW of Dutch Harbor. The Americus sank two days later in deep water. A search was begun for the Altair and the crew of the Americus when the Americus hull was identified. The life raft of the Altair was found on March 16, 1983 near the area where the overturned Americus was sighted. No crewmen from either vessel were ever found. Lost with the Altair were her captain Ron “the coach” Biernes (47), engineer Jeff Martin (23), cook and deckhand Tony Vienhage (27), deckhand Brad Melvin (26), deckhand Lark Breckenridge (24), deckhand Troy Gudbranson (21) and deckhand Randy Harvey (23). The two vessels and their crews came from Anacortes, Washington and were preparing for the soon to open tanner crab season. The U S Coast Guard Investigation that followed concluded that the vessels likely capsized due to the large amount of weight above deck from the crab gear aboard as well as equipment that had been added for the drag fisheries. Fuel distribution and crab tank flooding were also cited as possibly affecting the stability of the vessels. AMATULI (1987) The fishing vessel Amatuli caught fire and was abandoned February 6, 1987 approximately 45 miles east of Saint George Island. AMBER DAWN (2001) The 91 foot stern trawler Amber Dawn sank March 5, 2001 approximately six miles north of Atka Island. The Amber Dawn and the 267 foot factory processor Katie Ann were traveling to the lee of Atka Island to escape a storm when the trawler began to list heavily and take on water. She sank within minutes. Kodiak fishermen Gary McCormick, Ralph Clarmount and Chester Penasewiz were rescued by the Katie Ann. Two other crewmembers, Doug Rowe and Roman Telak were lost. AMERICAN STAR (1990) The 110 foot steel crab fishing vessel American Star drifted onto the beach and was lost January 29, 1990 on Otter Island in the Pribilof Islands. All six crewmembers were rescued by a U S Coast Guard Helicopter. AMERICUS (1983) The 194 ton 111 foot steel oil screw fishing vessel Americus capsized and was lost with all hands February 14, 1983. The vessel departed Dutch Harbor approximately 8:30 a.m. bound for the crab grounds in the Pribilof Islands with a load of crab pots. Her overturned hull was sighted at just after 3:00 the same afternoon, 25 miles NNW of Dutch Harbor. The Altair, sister ship of the Americus, was discovered missing at the same time. The Americus and Altair carried crews of seven men each and hailed from Anacortes, Washington. The Altair was never found, and the hull of the Americus sank on February 16, 1983 in 4,000 feet of water. None of the men from either vessel were ever found. The life raft from the Altair was found near the site of the lost Americus. The seven men lost from the Americus were captain George Nations (43), his son deckhand Jeff Nations (19), relief skipper Brent Boles (24), engineer Larry Littlefield (29), cook and deckhand Paul Northcutt (24), deckhand Vic Bass (19) and deckhand Richard Awes (20). The Coast Guard Report cited instability caused by the carriage of crab pots, the vessel’s drag gear conversion, apparent weight gain above and beyond the drag gear conversion, crab tank flooding and fuel distribution; all factors that may have led to the loss of the both vessels. ANDREI PERVOZVANNY I (1779) In 1779 the Russian vessel Andrei Pervozyanni I was lost on a trip from Attu to Amchitka. Source: Shipwrecks of the Alaskan Shelf and Shore (1992) Pg 1. AOYAGI MARU (1988) The 288 foot Japanese reefer cargo ship Aoyagi Maru lost power and grounded on a reef in a storm December 10, 1988 in Lost Harbor on the west side of Akun Island. Line caught in the wheel of the ship while transferring frozen fish to the Bering Trader precipitating the disaster. There was no loss of life. A demolition contractor was assigned the task of burning the 3,000 gallons of diesel and 80,000 gallons of bunker fuel on board in January of 1989. ARARE (1942) The 1,850 ton 388 foot Japanese destroyer Arare was torpedoed and sunk by the U S submarine Growler (SS-215) July 6, 1942 seven miles east of the entrance to Kiska Harbor. 104 persons aboard the Arare were killed. The Arare had been anchored off of Salmon Lagoon because of fog. ARCTIC DREAMER (1983) The 195 ton 81 foot fishing vessel Arctic Dreamer capsized and sank in heavy weather March 11, 1983 approximately 10 miles north of Dutch Harbor. The vessel was on the way to Dutch Harbor to deliver a load of crab. The crew of 6 was rescued by the fishing vessel Starlight. ARCTIC HUNTER (2013) The 93 foot steel fishing vessel Arctic Hunter ran onto the rocks and was destroyed near Summer Bay north of Morris Cove November 1, 2013. The master of the vessel had fallen asleep at the helm. The F/V Bristol and F/V Saga arrived on scene to assist. All crewmembers of the Arctic Hunter abandoned ship in survival suits to a life raft which was towed over to the Saga. The Arctic Hunter was subsequently scrapped. ARCTIC ROSE (2001) The 92 foot catcher processor Arctic Rose sank with all hands April 2, 2001 approximately 200 miles northwest of Saint Paul Island near Zemchug Canyon. An EPIRB signal from the Arctic Rose was picked up by the U S Coast Guard Station at Kodiak at 3:00 a.m. and a C-130 was dispatched. A life raft, survival suits and an oil sheen were spotted around 8:30 a.m. by the aircraft which was directed to the area by the sister ship of the Arctic Rose, the Alaskan Rose. Subsequent searches and investigations revealed the loss of the entire crew of 15. Lost were skipper David M Rundall of Hawaii, Shawn M Bouchard (25), James Mills (25), Angel Mendez (35), Kerry P Egan (35), Aaron R Broderick (22), Jimmy L Conrad (22), Robert Foreman (30), Edward F Haynes (35), G W Kandris (25), Kenneth R Kivlin (50), Jeff Miencke (19), Michael Nevreiter (37), Mike Olney (47) and David Whitton (30). Skipper David M Rundall’s body was the only one recovered at the time of the disaster. On September 12, 2009 the longline fishing vessel Blue Gadus snagged a mass of tarp and webbing from which several bones were recovered. The longliner was fishing in 426 feet of water 40 miles southeast of where the Arctic Rose sank. The bones were found to belong to Jeff Miencke who had been lost on the Arctic Rose more than eight years earlier. ARCTICUS REX (1990) The 29 foot aluminum salmon fishing vessel Arcticus Rex capsized and sank in 30 knot winds October 8, 1990 in Unimak Pass. Both crewmembers were lost including Gary Marshall (36) of Kingston MA and Deborah Caterson (29) of Anchorage. ASTRON (1971) The 107 ton 74 foot wooden oil screw fishing vessel Astron exploded and burned in the Bering Sea in November 22, 1971 six miles north of Akutan Island. 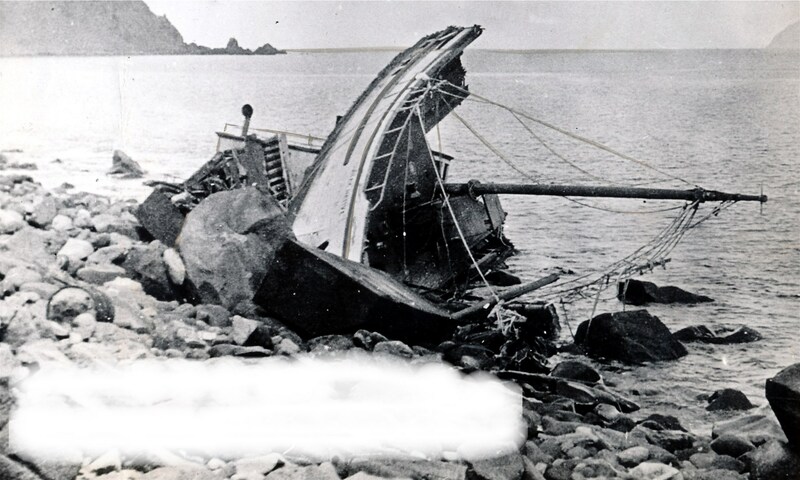 The four crewmen aboard survived in a seven foot rubber raft three days until rescued by the Japanese trawler Chidori Maru No 51 near North Head. Living to tell the tale were captain David Densmore (25) of Astoria, Douglas Sterly of Kodiak, Jan Federson of Juneau and Yakima and Dennis Jette of Seattle. ASTRONAUT (1967) The 77 ton 59 foot steel oil screw fishing vessel Astronaut stranded and was lost February 6, 1967 on Akutan Island in the Aleutians. Two skiffs, one from the Honey B and the other from the Menshikov attempted to reach the crew of the Astronaut and both were destroyed in the surf. Four crewmen from the two skiffs joined the four crewmen from the Astronaut on the beach. Four of the eight stranded crewmembers were rescued from the beach by the fishing vessel American Star. The survivors were suffering from hypothermia and frostbite. Tents and sleeping bags were dropped to the last four survivors as they awaited rescue by the U.S. Coast Guard cutter Citrus.